When last week's Entertainment Weekly arrived, I immediately opened it to the Books section -- like I always do. I was so excited to see that they reviewed CARRY THE ONE by Carol Anshaw and also featured it on their Must List. I admit that I was in the process of reading it and loving it, and I was kind of proud of myself to be "ahead of the game" for once. Entertainment Weekly gave CARRY THE ONE a very rare A rating, and I couldn't agree more. My only issue with CARRY THE ONE is a personal one. Ever since finishing this novel, I have been trying to wrap my head around everything that happened and find the words to share just how special of a book this is. Ms. Anshaw set out to "make a story that has sweep but feel concentrated." She also "wanted to make a book that is recognizably a novel but also something a little new." Her words pretty much sum up this novel way better than anything I could write, and I am tempted to just leave it at that! CARRY THE ONE tells the story of three siblings whose lives are forever changed after a horrendous accident. The book follows each of their stories for next twenty-five years as they navigate their ordinary lives; however, the after-effects of the accident are never far from their thoughts... and as a result, their actions. This book examines so much about everyday life from love to marriage to friendships to heartache to loss; and it shows how our actions affect those who surround us. It's an extremely powerful novel and I have to say that I was truly blown away by the scope of this book and what the author accomplished. Ms. Anshaw is an incredibly talented author and I was extremely impressed with her writing. I honestly do not have a single complaint about how she presented this story. Her descriptions are remarkably vivid and allowed me to picture every scene perfectly, and her prose is equally beautiful. The characters are all interesting in their own right, and I thought their evolution through the years following the accident was fascinating. I especially appreciated the exchanges between them and I thought their dynamics seemed to be very real. But the true beauty of this novel is on a much larger scope that just the descriptions, prose, and characters. CARRY THE ONE is a story that not only touched my heart, but also make me think. It ultimately made me reflect on my own life and my relationship with others. And that says an awful lot about a book when it can change the way you see the world. I really don't have much in common with the characters in this novel; however, CARRY THE ONE isn't just about the lives of these three people... it's much, much bigger in scope. CARRY THE ONE looks at how a single event in our past can influence our future behavior and the relationships in our lives. It also shows how the effects of living with guilt can destroy what is near and dear to us. 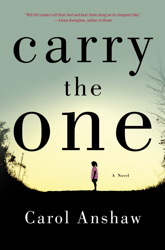 I can't think of a more discussable book than CARRY THE ONE, so naturally I recommend it for book clubs. There is a reading guide which touches upon some of the many discussion worthy topics in this novel. Some of the themes you might want to explore include guilt, redemption, addiction, forgiveness, parent/child relationships, love, marriage, breakups, regrets, creativity, making amends, and loss. As you can already see, most of these topics are relevant to every reader so there should be plenty to discuss. I hope my review wasn't too much of a gush-fest, and at the same time, I hope it did justice to CARRY THE ONE. As far as I'm concerned, it's a must-read and probably will go down as one of my favorites of 2012. This sounds fabulous! I wonder if I could get my book club to read it. I have this one to read and for some reason keep putting it off...after reading your review and Heather's at Raging Bibliomania I'm putting Carry the One at the top of my stack! A best for 2012 sounds like the very book I need to read! Thanks for the suggestion. Isn't that fun to feel "in the know"? One of our book club picks got selected to be made into a movie and I had that same feeling. This one sounds so good - will keep my eye out for it!